STO finds out what Frogmore Paper Mill – said to be the world's oldest mechanised paper mill – offers in the education department, including opportunities in History, Science and Art & Design. Frogmore Mill is a heritage paper mill with a papermaking machine dating from 1895 based in Hemel Hempstead. Today it stands as an industrial and environmental activity centre offering a learning opportunity for pupils in historic surroundings. Schools are offered practical, activity-based sessions suitable for students from Reception to Year 13. Topics like paper science, weaving, braille, letter pressing, canals and recycling are available for Key Stages 1 and 2, while Key Stages 3 and 4 can take session that link more specifically to National Curriculum subjects like History, Science and Art & Design. A school trip is centred on a mill tour and a papermaking activity, with the option of a third workshop that can be tailored to the curriculum. The paper mill’s facilities include two dedicated and adaptable learning spaces, suitable for formal teaching sessions and practical activities. The smaller accommodates approximately 30 students and the larger 75 students. There is a papermaking area where students will create a sheet of paper to take away, as well as learn about the papermaking process and its history. Pictured: Learning how to make paper. There is also a letter press printing demonstration area, a braille facility with two Perkins Brailler machines, a visitor centre presenting paper related artefacts from history, and a fully equipped digital training centre with 14 computer workstations and smartboard teaching aid for digital design activities. What can students do during a visit? A typical session at Frogmore consists of an introductory presentation and health and safety guidance scene setting introduction, followed by a papermaking workshop, a mill tour and another workshop. 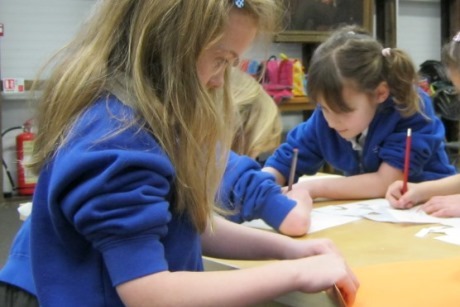 The activity sessions can cover a number of topics, such as recycling, the Industrial Revolution and making a sketchbook. In the first workshop, students are able to make their own handmade sheets of paper, which will be dried and ready to take back to school when the class leave. During the process, the children get to form, transfer and release the sheet themselves. The pupils are prepared for their mill tour during this paper making workshop. They’ll hear key facts about papermaking and understand how the principles of the handmade process is transferred to the machines they are about to see. Teachers should note that emphasis can be also put on the scientific process, recycling or history in this first workshop, as required. In Science, for example, the group will learn about hydrogen bonded cellulose mat, how it is formed and the importance of the Frogmore site in world history. A mill tour follows the paper workshop. Children will see industrial production in action, and enjoy viewing a 1902 Fourdrinier Machine (a paper machine). At the ‘wet’ end of the machine, stock (pulp mix) can be viewed as it changes from the appearance of cloudy water to recognizable paper as it travels through drying cylinders and onto a reel. 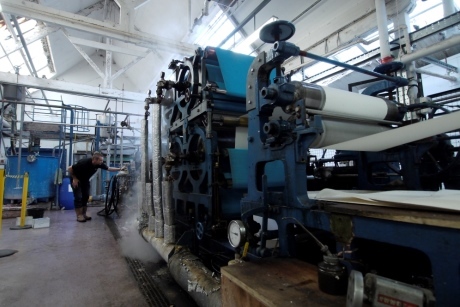 Pictured: A paper making machine at Frogmore. Further highlights on the mill tour include seeing waterwheels, the pulp preparation area and a firefighting display. The school group can then take a workshop in a topic of their choice. An Industrial Revolution session, for example, is based around the life of a character called Louisa Loveitt who worked in an envelope department from the age of ten until old age. Children will learn about working conditions, education and wages – all related to the age of the students attending. Social History and PHSE are covered in a workshop like this one. Other workshops on offer include one called Communication, which offers an in-depth look at the history of hot metal type and printing developments. Another session is called Recycling and the Environment, and offers an extended look at the science behind the paper industry. Visits typically last between two and three hours for Primary and Secondary school students. An education manager is available to help plan the content of a trip and teachers are welcome to arrange a free planning or viewing visit. 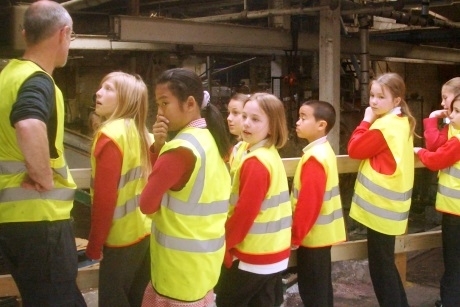 School travel organisers can book a visit to Frogmore Paper Mill or enquire further by calling 01442-234600 or e-mailing education@thepapertrail.org.uk. For more information visit www.thepapertrail.org.uk.